Kansas Representative Kevin Yoder gives a shout-out to OA Week and support for FASTR- Fair Access to Science and Research Act A Letter of Support for FASTR was signed by 65 presidents and provosts of higher education, including U of Kansas Provost, Jeffrey Vitter and sent to Congress on October 25, 2013. $$$$ is Available to U of Kansas researchers for OA publishing OA Week is winding down but the revelry carries on! How do OA megajournals speed-up article acceptance? What about niche journals compared to wide scope of megajournals? What about journal impact compared to article impact? Three higher education associations have formed a joint steering group aiming to build a network of repositories to provide public access to federally funded research articles and data. The proposed SHare network is a response to the White House Directivee issued in February, 2013 that requires all federal agencies providing funding of 100 + million to make publicly available the articles resulting from such funding. The SHare group is comprised of members from the Association of American Universities, Association of Public and Land-grant Universities and Association of Research Libraries. An alternative public access plan, Chorus, has been proposed by the American Association of Publishers. The issue of whether publisher groups or higher education groups should build and manage repositories of research articles resulting from federal funds is under debate. Federal agencies with 100 + million in R & D funding were to have submitted public access plans to the Office of Science and Technology Policy (OSTP) by August 27, 2013 per a White House Directive issued in February, 2013. The public access expansion directs other federal agencies who issue grant funding to require that recipients post the results of their research in public access systems similar to PubMed Cental, the NIH funded research article repository. This news announcement by the Association of American of Publishers contains their proposal for developing a public access database called Chorus. There are pros and cons to giving publishers control of public access databases, so look for future posts pointing to news announcements from other agencies proposing alternative public access repositories. Epocrates is continuing their Student Appreciation Program. Through the month of August, KUMC Medical Students can use Epocrates Essentials free for the entire year. This is a $159 value! Complete the form at http://www.epocrates.com/e/edu/medstudents, selecting "Univ of Ks Sch of Med" as your school. Select “GET IT NOW”. You will be redirected to the Epocrates registration page where you can register for a new account or sign into your existing account. To access the free Epocrates Essentials you must list your occupation as “medical student”. Verify their medical student standing. If you cannot be verified immediately, you can “SKIP” this section and Epocrates will follow up directly to verify. Epocrates Essentials and the discount should reflect a cost of $0.00. When you have confirmed the purchase, you will be directed to download Epocrates on your device. We're sorry that Epocrates only offers the Appreciation program for medical students and not nursing or other health profession students. Dykes Library is open 24/7! Beginning today (July 15), Dykes Library is open 24 hours a day, 7 days a week to KUMC students, faculty, staff and employees/residents of The University of Kansas Hospital! Library personnel will be available to assist users Monday through Friday from 6 a.m. to 10:00 p.m. and from 8 a.m. to 10:00 p.m. Saturday and Sunday. Please note that all patrons will need their KUMC ID badge to access the library after 6 p.m. If you are a KU affiliate or would like access to the library for health sciences or scholarly research, please call ahead for access information at 913-588-7166 during library business hours. Questions? Please call the library front desk at 913-588-7166. Experts.kumc.edu is now available. Our host has resolved their outage problem which affected multiple sites across the U.S. We apologize for the inconvenience. Experts.kumc.edu may be unavailable temporarily. We're investigated the cause and hope to have it resolved shortly. A proposal recommending that universities and libraries collaborate with federal research funding agencies to expand public access to research is circulating. Shared Access Research Ecosystem, or Share, maintains that universities and libraries have infrastructure in place via institutional repositories and have long histories of experience with sharing and preserving research. The Share proposal is under review by the Association of American Universities, Association of Public and Land-grant Universities and Association of Research Libraries. An article in The Chronicle of Higher Education reports on the Share proposal and references another recent draft released by the publishing industry that outlines publishers' solutions for meeting the August 22nd deadline to expand public access to federally funded research and data. You can view that blog posting here. New display at Dykes Library! 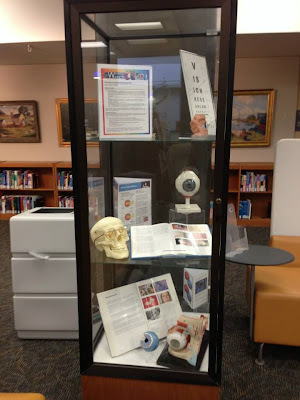 Come check out our new "eye" catching June display celebrating Vision month! If journal publishers, with the backing of the Association of American Publishers, get congressional approval to implement a public access clearinghouse, one blogger states "this would be the equivalent of the NRA running background checks on firearms purchases." Read the full post by Michael Eisen. Booking a study room is now mobile-friendly! Booking a study room has never been easier! Next time you want to reserve a study space, simply use your Smartphone to visit the library website, click on “Book a Study Room” and type in your reservation information. Voila! This new mobile-friendly feature will make it even more convenient to reserve an individual or group room. Study room policies apply. Start and End time dates display in reservation boxes for desktop and mobile. Reservation boxes stay with the table and don't get lost outside the viewing area. Room names stay in view as you scroll down the table. Updated to the latest KUMC branding. Questions? Call the front desk at 913-588-7166. For many years, the A.R. Dykes Library has participated in the Greater Kansas City Science and Engineering Fair sponsored by Science Pioneers. Dykes Library awards one prize in both the Junior and Senior categories. Only medically related projects (health, anatomy, vision, dentistry, psychology, etc.) in the Biological and Behavior Sciences categories from the Junior and Senior levels are judged. The Senior division winner receives a one-year membership, which includes remote access to electronic resources. The winner in the Junior division receives eight hours of research consultation with a librarian and $50 of free printing. Awards were presented March 16. We are no longer maintaining the SEPAKansas.org web site. Visit the links below to find more information about SEPA Kansas. http://web.archive.org/web/20120515000000*/http://sepakansas.org, Internet Archive's last archived version. 1. SAS: Available in library classrooms G024, G025 and 1028. 2. SPSS: Available on all library ground and first floor PCs, all study rooms, all library classrooms and Orr-Major student machines. 3. MatLab: Available in library classrooms G024, G025 and 1028. 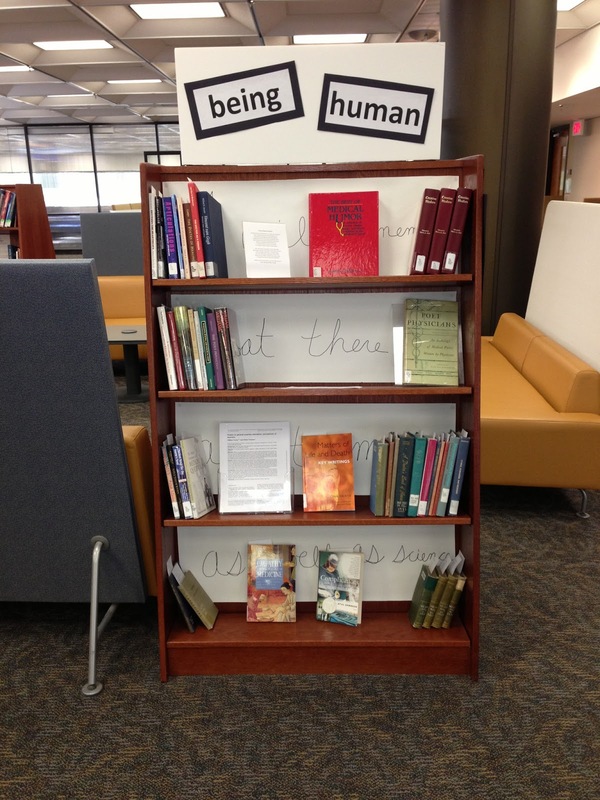 April was National Poetry Month and, although I was a little late getting the display up, the Being Human medicine and poetry display is now finished. 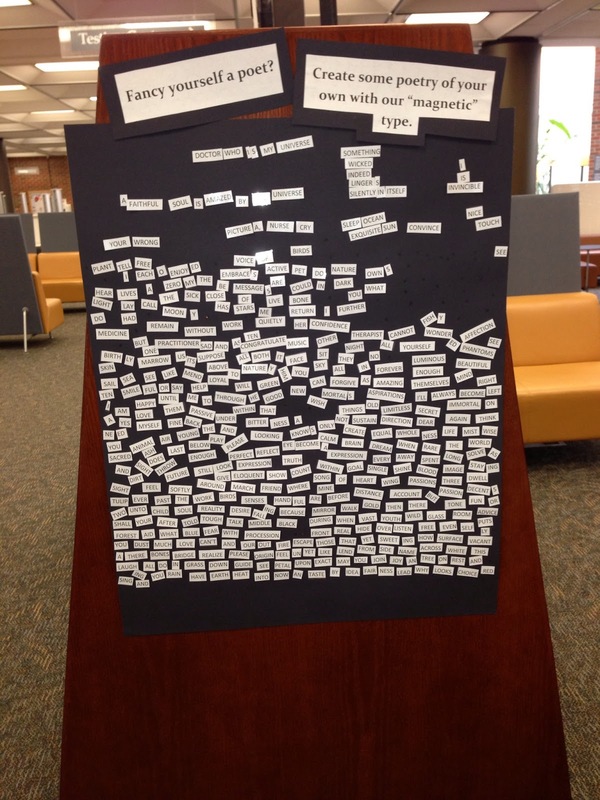 I have seen several students looking at the displayed materials (we even checked out one of the books yesterday) and the “magnetic” poetry board has been put to use. 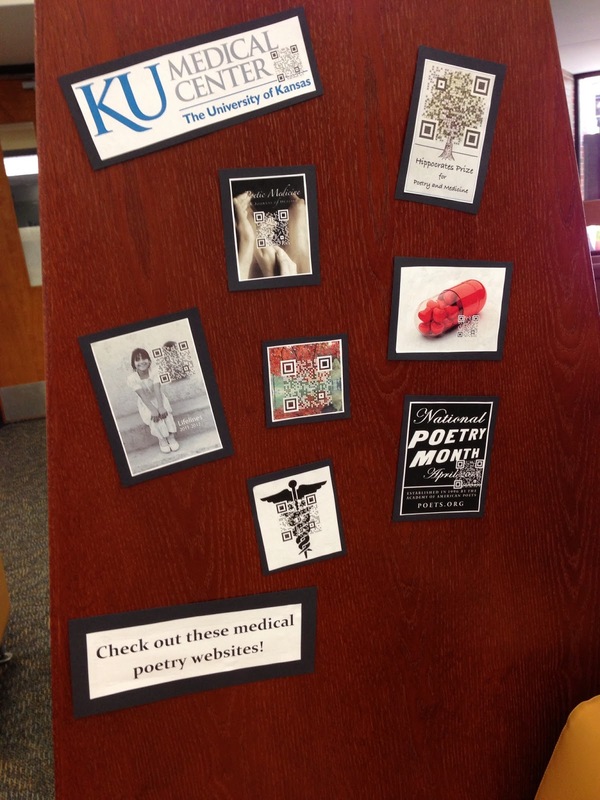 The display has materials from both Dykes Library stacks and Clendening, as well as articles from PubMed that discuss the validity of poetry in a medical practice. Each of the books should have either a Clendening bookmark, or a bookmark showcasing “Aphasia,” a poem by Noah Capurso for the Yale UCL Medical Students Poetry Competition. Hopefully this is the first of many interesting displays, as we plan on rotating them throughout the year.